I love Lysol with hydrogen peroxide. It's the best household cleaner ever! I've simplified my housework life with Lysol cleaning products. I’m a true believer of doing more with less and that belief is evident when I’m cleaning my house. I don’t like scrubbing and I try to stay away from products with strong, lung-piercing scents. In my effort to share things that help to simplify my life, here are the cleaning products I don't like to run out of. 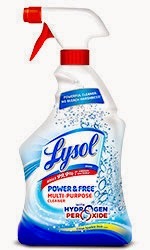 Lysol Power & Free Multi-Purpose products are great for cleaning up your kitchen in minutes. I use them on everything, including my sinks, counter tops, stove top, fridge, and anything else that needs a good cleaning. This stuff is great for cleaning up spills, cleaning hand prints around light switches, and getting spots off of walls. 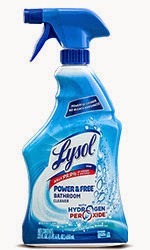 Lysol Power & Free Bathroom products work for me so I always have a bottle of the cleaner, wipes, and toilet bowl cleaner in all of my bathrooms. They make it so much easier to clean and leave a lovely scent. Give them a try and let me know if you agree.